Small fascial defects are an extremely common problem encountered by general surgeons. They are both spontaneous and iatrogenic in origin which impacts management. Small hernias also vary in location, commonly found in the umbilical and epigastric abdominal wall and at the site of previous incisions. The method of repair varies widely and includes: open approach, laparoscopic, primary closure, choice of mesh products, and methods of securing mesh and many other variables. This chapter will focus on addressing small fascial defects and specific techniques and indications for repair. 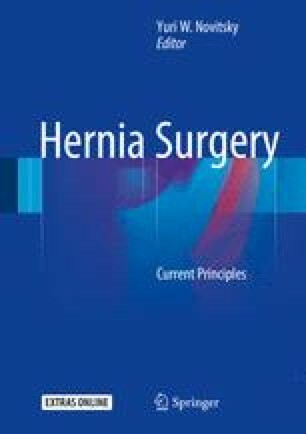 Though recurrence is a major concern with all hernia repairs, preventing the conversion of small problem into a complex defect is critical.